Size: 78" Weight: 1200D ripstop 100% Polyester. Filling: 200g. 3000mm/3000mvp. Colour: Black Ideal for in between seasons, this medium weight blanket is a must-have. When a lightweight sheet is too thin and a traditional turnout blanket is too heavy, your horse needs a compromise. This blanket is the middle of the road in protection for winter weather. Wide gussets allow enough range of motion to make frolicking in the snow or taking an early morning roll easy and effortless for your horse. Priced well, this turnout will be a welcome addition to your horse's collection when the weather is unpredictable in late fall or early spring. 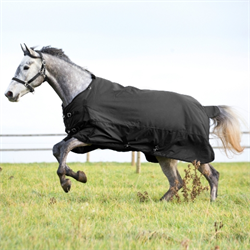 Features: Medium weight turnout blankets are ideal for changing temperatures. Your horse won't get too hot or too chilly when he wears this medium weight turnout during the day or overnight. Front buckle closures with quick snap closings and double cross surcingles keep the blanket from coming loose and falling off even during the most raucous rolls in the field, Long gussets at shoulders allow your horse's legs to move freely and not feel entrapped in the turnout blanket. The additional roominess of the chest area means he won't get sore shoulder from chafing too. A long tail flap and adjustable elastic leg straps will keep the blanket from blowing up around his rump if a strong wind kicks up. The recognizable Horze Z logo is printed on the rear quarter and shows the world your great taste by choosing a Horze blanket. Neck Piece sold separately.